The home inspection is a serious job since inspectors take up and evaluate nearly everything in and around a home and other structures on the property. One important point about home inspection is it needs to be processed around a contract for the safety of both side's rights. Here is a home inspection contract for you. 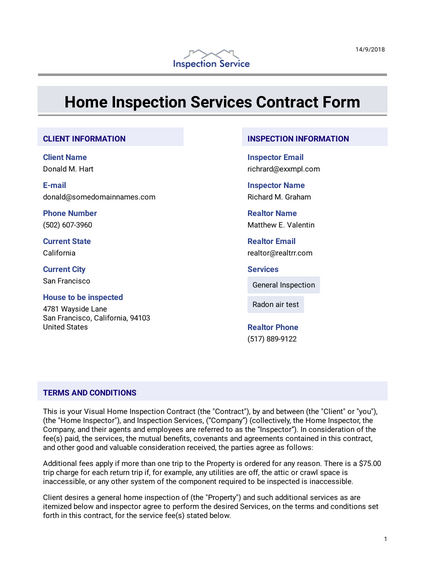 Our Home Inspection Contract PDF template contains client contact, inspector and realtor information and a generalized contract between home inspection company and the client with its signature field. Just don’t waste your spare time to construct a contract from scratch just try our Home Inspection Contract PDF template out! Additional fees apply if more than one trip to the Property is ordered for any reason. There is a $75.00 trip charge for each return trip if, for example, any utilities are off, the attic or crawl space is inaccessible, or any other system of the component required to be inspected is inaccessible. Client desires a general home inspection of (the "Property") and such additional services as are itemized below and inspector agree to perform the desired Services, on the terms and conditions set forth in this contract, for the service fee(s) stated below. SERVICES. By initialing where indicated, the Client confirms ordering or rejects ordering, the services are shown below (accepted services, including the general home inspection, are referred to collectively as the "Services") All services ordered are confirmed by checkboxes below. GENERAL HOME INSPECTION. The general home inspection (a "home inspection") is a visual analysis for the purpose of providing a professional opinion by a licensed home inspector of the condition of a residential dwelling and the dwelling’s attached garages and carports, any reasonably accessible installed components, and the operation of the dwelling’s systems, including any controls normally operated by the owner of the dwelling, for systems and components in the standards of practice established by Home Inspectors and applicable law and regulations. Condominiums, Etc. Home inspections do not include any property which is not conveyed to the Client. The home inspection does not include common areas or probable Association property, based solely on what is usual. Buyers always should obtain disclosures in a Condominium Sellers Certificate. Nothing in the home inspectors practice or report shall be deemed to be, or relied upon as, information, knowledge, or a professional opinion concerning exactly the property conveyed or any such matters. systems or components that were designated for inspection in the Standards of Practice but that were not inspected and the reason it was not inspected. Home inspections are non-destructive (holes are not drilled in walls, for example), non-invasive (floor coverings and wall coverings are not pulled away, for example), subject to concealment and latent defects, and limited by law and the standards of practice. The Inspector does not move furniture, personal property, carpets, ceiling tiles, plants, soil, ice, debris or the like, which can limit or obstruct visibility, nor does the inspector ignite gas appliances or pilot lights, operate shutoff valves (for plumbing or gas, for example) or manual stop valves, or operate circuit breakers or the like. The Inspector does not operate any system that is shut down, does not respond to normal controls, or does not function properly. The Inspector does not inspect any area, system or component deemed unsafe or dangerous and does not perform any action likely to damage property (such as probing a finished surface). The Inspector inspects only that property to be conveyed to the client and does not, for example, inspect probable common elements or association property in multi-unit housing or condominiums. For all those reasons, it is possible a condition or problem may not be seen, or go undetected, and be unreported. By signing below, the parties witness their agreement to the foregoing Contract terms and conditions. ATTENTION IS DIRECTED TO THE DISCLAIMER OF WARRANTIES, LIMIT OF LIABILITY AND OTHER CONDITIONS ABOVE.